Olfina Gray-Mane is a Nord food vendor who lives in Whiterun alongside the rest of her family. She usually wakes up and leaves House Gray-Mane at around nine in the morning to patrol the city, sometimes going to Dragonsreach. She patrols until 1pm, when she browses the local market. At 4pm, she enters the Bannered Mare to work there. She heads home at about 2am for sleep. 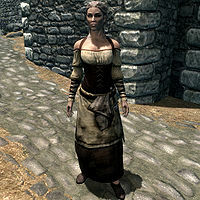 Olfina wears a set of barkeep clothes and a pair of shoes. She is equipped with a Skyforge steel dagger, and carries a key to the clan's house, as well as a selection of common items and gold. During a conversation she occasionally has with Anoriath he hints that she is in a romantic relationship with Jon Battle-Born, who is from the Battle-Born family, the Gray-Manes' rivals. Jon is found to be carrying a letter from Olfina which further evidences this romance. When near her, she'll tell you about her clan, saying, "I miss the days when the Gray-Manes and Battle-Borns got along. Ever since the war started, we've been at each others' throats." and "You wouldn't know it now, but the Gray-Manes and Battle-Borns were once fast friends." She appears to be strong and independent and won't hesitate to point this out to you, if your character is male: "What's the matter? You can't stand the sight of a strong Nord woman?" She will instead be encouraging to female characters: "It's not easy being a woman in Skyrim, I know. But stay strong, and men will come to respect you, and maybe even fear you." She strongly believes in the strength and power of women and can sometimes be found saying, "The daughters of this land are just as strong and loyal as its men." and "There's nothing a man can do that I can't do better, whether it's serving drinks or slaying trolls." Interestingly, despite her bold words, she is scripted to flee from all combat. Upon ending conversation, she'll tell you, "Yeah, take care." or "If you need a drink, just holler." if she is working at the Bannered Mare. During the quest Missing In Action, you may ask Olfina if there's anything she can tell you about Thorald, her missing brother. She'll reply with: "It's been a while now. I miss him, but it's clear he's not coming back. He knew what he was getting into. I don't... I don't blame anyone." If Whiterun is taken over by the Stormcloaks, the current jarl will be deposed and replaced with Vignar Gray-Mane, for whom Olfina will be the new housecarl. She appears to be committed to the job, as she'll tell you, "I take my duties as Housecarl very seriously. I won't hesitate to shed blood if my uncle Vignar is threatened." She is also very supportive of the cause: "When the Stormcloaks took control of Whiterun, it was a victory for all true Nords." If she is housecarl, she will also be present for the capture of the dragon Odahviing on the Dragonsreach Porch, although due to her cowardice she won't be much help in bringing him down. Anoriath: "Ah, Olfina. How may I help you?" Olfina: "Got any sausages? I'm cooking a special breakfast for a friend, and they're his favorite." Olfina: "Best you forget whatever you think you saw, elf. Such idle talk can prove hazardous to one's health." Jon: "So I'm, uh... writing a song for you..."
Olfina: "Why Jon Battle-Born. You're writing me a song? Does it somehow involve blood, or beheadings, or the honor of my forebears?" Jon: "Well, that's where I started. But it turned into something of a ballad." Olfina: "A ballad? Oh, now I know you're joking with me." Jon: "It's all true, I swear it. You can hear it when it's done. I'll just need a year or two smooth [sic] the rough edges." Olfina: "Ha! I thought as much." Olfina: "So have you spoken to that man from the Bards College?" Jon: "No, not yet. But I will. I just haven't... gotten around to it yet." Olfina: "Oh Jon, stop dallying. You know you have to go. It's why Mara put you on this earth. You think a few miles can truly keep us apart?" Jon: "You mean you won't forget about me the moment I'm out of sight? Get yourself a nice old rich husband, have sixteen babies?" Olfina: "Tsk. You've uncovered my master plan. Now I suppose you'll never leave." Jon: "I want to see you when you're done working." Jon: "That's your imagination running wild. Nobody knows how we feel about each other." Jon: "Sing you a special song tonight, beautiful lass?" Olfina: "Not now, I'm working." Jon: "Bah. You're always working. Why else would I spend so much time here?" Olfina: "Mikael is quite the songbird. Maybe he's the reason you're here all the time." OR "Perhaps it's because there's no better way to face the cold Skyrim nights than with a belly full of ale?" Jon: "Aye, the bard's got talent, I'll give him that. You just make sure his music is the only thing you're admiring." OR "Oh, there's a better way. A buxom barmaid between the sheets will keeps me plenty warm. Better yet, she won't make my head ring the morning after." Olfina: "Oh Jon, darling. You know you're the only stone-biting, knuckle-dragging Nord for me." Jon: "Ha! That's my girl." Peculiarly for a housecarl, she isn't marked as essential and can be killed at any time. If she is killed while she is housecarl, Irileth, Balgruuf's housecarl, will return from exile and resume functioning as housecarl in Olfina's place. She will continue to offer the same dialogue as if Jarl Balgruuf still controlled Whiterun. Some game data refer to Olfina as "Olfina the Golden" or "Olfine the Golden". She will not stay at Dragonsreach after she has become housecarl, but instead returns to House Gray-Mane for sleeping. This page was last modified on 7 January 2018, at 14:22.